US, 2007, 96 minutes, Colour. Directed by Adam Ravetch and Sarah Robertson. When the March of the Penguins made such an impression worldwide, it might have seemed inevitable that some film-makers would take themselves off to the Arctic and study the animals that populate that remote part of the world. 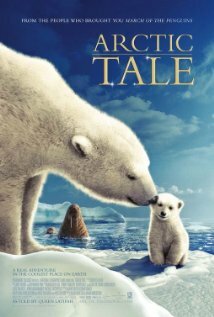 Where the Penguins’ story was ‘humanised’, especially by the English-language commentary from Morgan Freeman and the paralleling of bird behaviour to human actions and motivations, the Arctic Tale goes further and sets up a conflict drama between the walrus and the polar bear. This is a device that can keep the younger audiences attentive and interested. It may seem too ‘cute’ for serious adult viewers. However, some of the photography is quite spectacular and the commentary does inform us about the life cycles of the animals – and about their extraordinary capacity for endurance of cold, of lack of food, of ability for travelling over the floes and through the Arctic waters. The film shows the mother bear’s hibernation, the early struggles of the cubs, their growing up, hunting and, eventually, being able to stand independent of their mother. But, not all survive. The walrus family is important and the family that hunts together stays together. Otherwise, death is inevitable. As the bears hunt the walrus and, as the previously unseasonable warming melts the ice, the search for prey for food becomes an enormous struggle. The commentary is by Queen Latifah. It starts quite objectively but then moves into almost equating the animals with humans and takes on an American colloquial touch. But, it is the visuals which count.